He may have dropped the 'MF' form his name but the metal face is most definitely back behind the mask with his first album in years. In his absence the expectation has grown to mammoth proportions. The Mouse And The Mask elevated his status to stellar and with its success Doom was primed for something huge. So he goes to ground. The last time he did this was after the demise of KMD and the death of his brother, emerging as the masked villain he is today. His emergence here is less drastic, but things have definitely changed. There are of course the usual cartoon related samples peppering htis album but naming the album after Charles Bukowski's 'Dinosauria, We' and including a lengthy sample from the man himself shows a new seriousness breathing a cold breeze through the record. It's still as comic as ever but there is a renewed malevolence creeping in and Bukowski's input on Cellz sends an apocalyptic shiver down the middle of the album. But for all the time underground this is not the album I expected to break the silence. His name is more focused and so is his rhymes. Born Like This is not a blasting trumpet heralding the return of the king, instead its power is almost unrecognised on first listen, but it soaks itself in slowly and after spending some quality time with this record it stands up as some of his best work since Madvillainy. Production duties are shared between Doom himself, Madlib and the awesome Jake One. There's some resurrected beats by Dilla including the much used Lightworks and a three year-old collaboration with Ghostface. But with all these heavyweights onboard Born Like This is very understated. Bass is used sparingly on the beats and Doom's rhymes plod methodically with deeper gravel tones than usual. It's nothing new to see a Doom album scattered with short, sharp tracks and the result of this unifies the album into an entity that needs to be heard as a whole to be fully appreciated. The three standout cuts for me are the darkly booming Ballskin with its sinister melody; Rap Ambush which features an impressive boom/clap beat where Doom tells of an insurgent attack on enemy forces, sending wave after wave of R.P.G's - Rhyme Propelled Grenades; the other choice cut is That's That, a tight rhyme over a sweetly melancholic clarinet tune that also ends with some Doom singing which really shouldn't be allowed. It's not all good though, there's some pretty weak moments like the clumsy Supervillainz, the slightly weary Lightworks and the tiresome homophobic content on Batty-Boys, where the constant references to gay superheroes may well be clever but get boring quite quickly. To come back after this long under the weight of so much expectation with an album as restrained and focused as this can only be applauded. 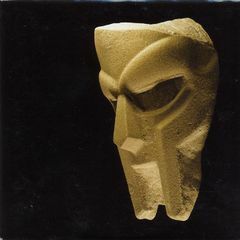 Doom reestablishes himself as one of the most intelligently gifted MCs around and the downplayed nature of this record only serves to allow his fans space to marvel at the intricacies of each expertly dropped word.